In recent decades, engineering consultancy services are gaining its demand due to the rapid growth of the construction and building industry in Malaysia. The mushrooming mega infrastructure development projects introduced by Malaysia Federal Government, such as Mass Rapid Transit Line 2 (MRT2), Light Rail Transit Line 3 (LRT3), and Pan Borneo Highway, had significantly boosted the construction industry in Malaysia. Besides, the introduction of various economic corridors such as Iskandar Malaysia (IRDA), Northern Corridor Economic Region (NCER), East Coast Economic Region (ECER), Sabah Development Corridor (SDC) and Sarawak Corridor of Renewable Energy (SCORE) had even further concreted all kind of property developments in the regions. Despite the increasing demand of engineering consultancy services, firms are still facing a lot of challenges in securing new projects, especially for small and medium scale of firms. High competition and intangible service quality are among the challenges faced by engineering consultancy firms in obtaining new projects. The numbers of engineering consultancy firms had been increased tremendously in recent years. According to Board of Engineers Directory, there are nearly 2,000 civil and structural engineering firms and nearly 1,600 mechanical and electrical engineering firms available in Malaysia. The high similarity and intangible service quality had made clients hard to differentiate these huge numbers of consultancy firms in term of their service quality or performance. Creating positive brand equity in engineering consultancy firms is possibly an alternative strategy for the consultancy firms to market themselves and differentiate their consultancy services from competitors. Strong brand equity often implants the meaningful brand images into the mind of clients and eventually creates differentiation and influence the positive buying behaviour. Clients prepare to pay more, perform brand recommendation, consider brand extension, and even repeatedly purchase the favourable brand if the brand loyalty of the clients had been achieved (Biedenbach, Bengtsson, & Marell, 2015). So now the question is: How firms could enhance their brand equity and excel themselves from competitors? Previous study suggested customer participation is a one of the criterion that remarkably influence the performance of professional services sector due to the high clients’ interaction and involvement during the service delivery processes. Clients are required to provide sufficient information and participate actively in its actual design and production processes. Therefore, it is critical for firms to focus on customer experience by creating the efficient company-client relationship, ensuring seamless communications, and enhancing the frontline personnel communication and interaction skills (de Brentani & Ragot, 1996). 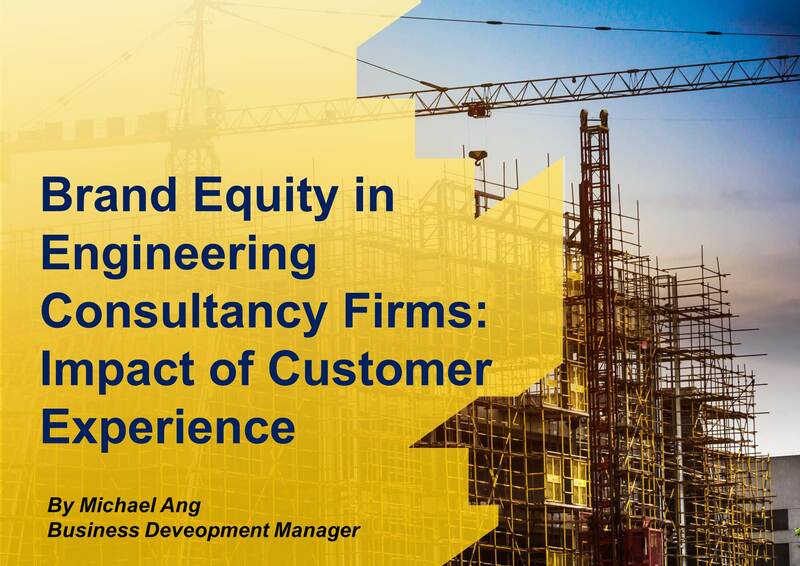 It is proven from the recent study, that the better the customer experience as the result of the personal interaction, the higher the brand equity of engineering consultancy firms could be achieved (Ang, 2018). Good customer experience not only impact the brand equity of engineering consultancy firms as a whole, but also impact every single component of brand equity hierarchy positively, i.e. brand awareness, brand association, perceived quality, and brand loyalty. The results of the research are not surprising. Due to the intangible characteristic of services, customer experience is the most direct approach for clients to judge the performance of engineering consultancy firms. Good customer experience is generally generated from high work quality, prompt response, reasonable price, timely submission, and fast authority approval. If all the above are achieved, brand equity of firms are definitely enhanced. In conclusion, the customer experience management shall not only taken care by marketing or business development personnel, the engineers who have the direct interaction with clients shall also take an important role in ensuring the satisfaction of clients in consuming the services. When the customer experience is managed from all angles, brand equity shall be enhanced and be a competitive advantage of the firms. By that, firms could be differentiated from the competitors and stand a better chance in pursuing new projects from clients. Ang, E.H. (2018). Brand equity in engineering consultancy firms: Impact of customer experience. de Brentani, U., & Ragot, E. (1996). Developing new business-to-business professional services: What factors impact performance? Industrial Marketing Management, 25(6), 517–530. Frow, P., & Payne, A. (2007). Towards the “perfect” customer experience. Journal of Brand Management, 15(2), 89–101.